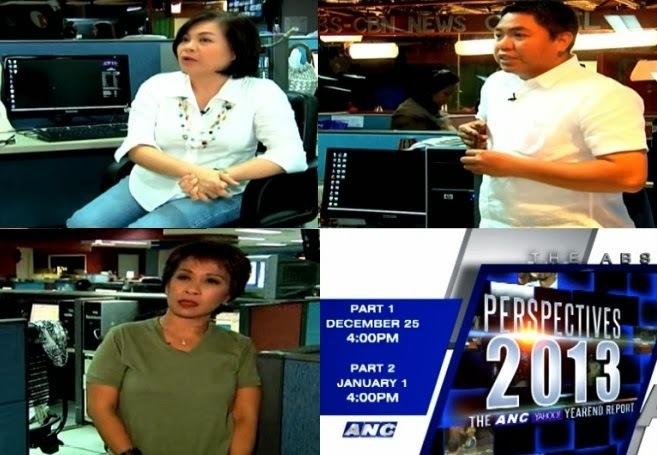 The ABS-CBN News Channel (ANC) will revisit the year’s biggest and most important news stories through the perspective of journalists that covered them in a two-part yearend report that airs on December 25 and January 1. Using Yahoo!’s metrics, ANC selected the stories – from disasters to scams, wars, and showbiz developments – that got the most hits on the ANC-Yahoo! website (anc.yahoo.com), as well as the most searched news items on Yahoo! Philippines. “Perspectives: An ANC-Yahoo! Yearender” will highlight the back stories of the news events that mattered to viewers and netizens, with reporters talking about their experiences, the challenges, and the lessons they learned during coverage. ANC’s current affairs program “Inside Business,” anchored by ANC Business News Head, Coco Alcuaz, will also deliver exclusive interviews with influential and multi-awarded entrepreneurs on Christmas and New Year’s Day. Alcuaz will sit down with Ed Chua, the chairman of Shell Philippines and Management Association of the Philippines’s Man of the Year on Wednesday (Dec 25), and with Ben Chan, Bench chairman and Ernst and Young’s Entrepreneur of the Year on January 1 to discuss the trends and challenges in their respective industries, marketing in the country, and leadership. “Business Nightly,” meanwhile, will air a two-part discussion with undergraduate economics and business students on the challenges and opportunities that confront them and the country, their goals and ambitions, and careers and entrepreneurship. ANC also ushers in 2014 by airing the simulcast of ABS-CBN’s New Year Countdown special, anchored by Henry Omaga-Diaz and Nina Corpuz, at 11:45 PM on December 31. Don’t miss the two-part “Perspectives: An ANC-Yahoo! Yearender,” 4 PM, “Inside Business,” 7:30PM on December 25 and January 1, and “Business Nightly,” weeknights at 9PM only on ANC (SKyCable Channel 27). For more news updates, like www.facebook.com/ANCalerts, follow @ANCALERTS on Twitter, or visit anc.yahoo.com.